We’ve been in the house for nearly a week. Time to hit the road! I’m serious. We haven’t even unpacked the Airstream from our four month odyssey this summer, and we’ve already found a reason to take off again. On Sunday I was doing what suburbanites do all over the USA: reading the Sunday paper. (In my case, it was mostly for the novelty of it, since I haven’t read a Sunday paper in about a year.) And there it was — an ad for the Copperstate Fly-In,the fourth-largest fly-in event in the USA. To appreciate how that hit me, you need to know that I was for several years a card-carrying member of the Aircraft Owners and Pilots Association (AOPA) and the Experimental Aircraft Association. In those heady days B.K. (Before Kid) when we had disposable income from two well-paying jobs, we owned an airplane which we flew all over the east coast. My mother, father, and one older brother all have pilot’s licenses. In the era B.K. 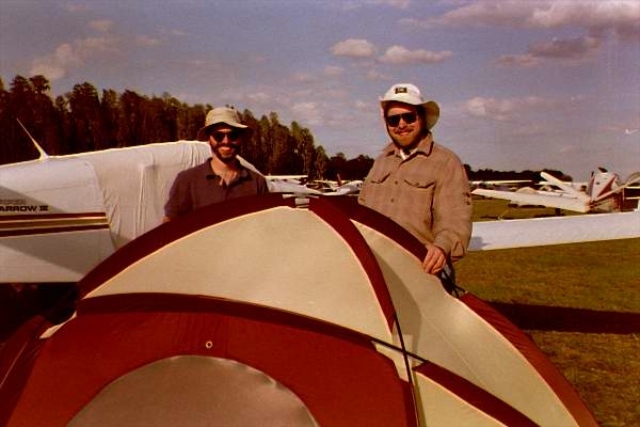 my brother and I flew to major aviation events including EAA’s Oshkosh, the world’s biggest fly-in, and camped next to the airplane in a tent along with 13,000 other aircraft. 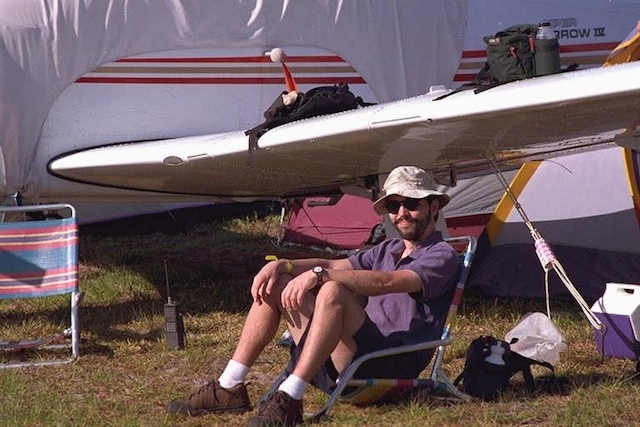 My brother and I also flew to the 2nd largest fly-in event, Sun-n-Fun, in central Florida, and camped there too. The third largest fly-in is the Arlington Fly-In, held up in the northwest. I haven’t made it to that one yet. But I was pleasantly surprised to see that the fourth largest fly-in is held only about 80 miles from our home, right here in southern Arizona, this week! It seems like the perfect diversion from sedentary suburban life. The weather in southern Arizona is ideal right now, and it’s a shame to spend the time cooped up in the office. I think Eleanor is not in a hurry to settle into housewife mode either. All I had to do was mention the existence of Copperstate, and she was immediately on board. One of the really great parts about camping at a fly-in is that you can always hear the sound of engines coming and going, all kinds of different engines. Old rotaries radials on the antique fabric bi-planes, pistons on the modern single-engine craft, turbines on the big boys, little 2-strokes on the ultralights, and lots of variants. Pilots love aircraft noise. It is part of the fun of being on the field. I remember one damp morning, very early, at Oshkosh when we were overflown by a low-altitude diamond formation of WW II bombers. I’ll never forget it. The sound was so thunderous and menacing that we all were shaken from a sound sleep and rolled out of our tents thinking (in our half-awake state) that we were going to die. It was great. So I hope for a few exciting moments like that, this week. Feeling the ground shake as 50-year-old warbirds fly over gives you a tiny taste of the fear of war. In that moment when the bombers passed by, I suddenly knew the terror and helplessness that people must have felt in Europe when the machines of World War II visited them. I think that’s an experience that would be good for anyone, to have perspective on what it means to go to war. And during the rest of the time, I hope Copperstate causes us to meet some local aviation folks, and maybe a few RV’ers. I’d like to explore the possibility of getting back into aviation in the next few years. It would be fun to do a little flying again, perhaps in an ultralight like we used to do in Vermont. So now we are re-packing the Airstream. Since we took very little out of it, our re-packing efforts are more about removing things than loading up. Eleanor has unloaded some heavy items like Emma’s schoolbooks and her sewing machine, and we’ve taken out the things that we were transporting from Vermont. We’ve filled the fresh water tank and defrosted the refrigerator. Tomorrow I’ll toss my office bag back in there and hitch up. That should do it. I just knew it would not last long! Someone is going to have to nail your feet to the floor to keep you in the house. All three of you have vagabond hearts, a house just ties you down man…. Have fun at the fly-in, sounds like a blast! By the way, that guy in the second photo is not my brother, but my friend Andy. Andy, remember that trip back in 1997 or so? I remember — even though we had the good sense to stay at a motel! Reading about this trip brought back some very fond memories, so my question (again) is — Can I come too? Don’t forget tents and small RV’s blown over by propwash. And the stories- what about that guy who wasn’t IFR going across Lake Michigan with the ceiling moving down as he went. He said by the time he got to WI shore he was at 50′. We were just clearing radio towers as I remember coming in. OSH Specs:12,000 planes fly in within a week, 500,00 show up. 500 seminars, 2,500 show aircraft (just looked it up). Check out the options for recreational planes these days, they aren’t bad. You may hear a lot of RADIAL engines on the old fabric birds, but unless there are some world war 1 era birds there, it is unlikely that you will hear a ROTARY engine. On the rotaries, the crankshaft was bolted to the firewall and the entire engine turned. WW 1 pilots could do almost square turns in one direction by using the precession of all that rotating mass. Go Water Rabbit go… Your dragon ladies will take good care of you.